Do you know any creative dog exercise methods? Exercising your German Shepherd is absolutely crucial to your dogs physical and mental well being and health. Not only do you spend more quality time with your German shepherd, but you are also helping to maintain good body weight for your pet, develop your dogs muscle tone and improve joint, lung and heart functions. As always we are here to help you and would like to offer you some creative suggestions right now for some inexpensive dog exercise methods for both physical and mental stimulation of your German Shepherd. Try out as many or as few of these creative dog exercise methods as you’d like and I’m sure you’ll find a least one your pet will really enjoy. So, here we go, creative dog exercise methods, part one. Make sure you toss the ball long not high. The reason you want to throw the ball for distance, not height, is because you do not want your dog jumping because your pet may hurt himself. Be careful as to what type of ball you use as well. Make sure the ball is large enough that it cannot be a choking hazard for your German Shepherd. Join a Doggie Play Group. Get your dog involved with other dogs to play together. Dogs are social or pack animals and enjoy this physical and mental stimulation. Not only is the exercise essential but the socialization skills the dogs practice with each other is priceless. You can always learn the basics for obedience training in a few short classes, and then work with your dogs on the techniques you have learned at home. If you find that you both really like this kind of activity you can continue on to compete in obedience competitions as well. 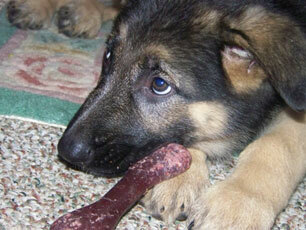 Many fun walk-a-thons now offer the opportunity to bring your GSD along too. This is a great way for both of you to get some exercise, socialize with others and help raise awareness or funds for a good cause too. Many ball driven German Shepherds simply go crazy for this form of exercise and while there is a definite amount of training to do fly ball correctly, many dog clubs offer fly ball for free. Contact your local kennel club for more details. Letting your dog yank you around the house while you hold his/her favorite Tug O War Dog Toy can be an enjoyable exercise too. Make sure the toy is soft to avoid teeth or gum problems and, even more important, make sure that the dog knows the “leave it” command so that it will let go of the toy when you give it the “leave it” command. One of the instinctual habits dogs have developed is the ability to weave in and out of trees while chasing its food. Use a few new plungers adhered to your wood or tile floors and teach your dog to weave his way in and out of the plungers. 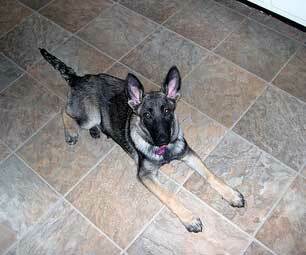 Start slow and over time you can graduate your German Shepherd to even faster Weave Poles speeding skills. Take your German Shepherd for a walk around the block or in a park or to any dog friendly locations that you are aware of. Always mix up the locations, and, or, directions of your walk to keep it interesting for both you and your GSD. If you are close to any beaches, lakes or streams check to see if they offer you the opportunity to let your dog go for a swim. This is a great exercise outlet for your dog. Important tip: make sure that your German Shepherd can swim first before you get too involved in attempting swimming because not all dogs can swim. There are dog life jackets available too if you happen to need them. Better safe than sorry. Teach your German shepherd to "find it". Your pet will enjoy the mental work out as well as the physical exertion of locating his favorite toy or treat. Mix things up by changing the location of where you hide the toys and what toys are being hidden. If you're trapped inside you can use two kitchen chairs and place an item like a broom between the lower rungs on them and teach your dog to jump over the bar on command. Remember to start very low and work your way up in height and also do not start jumping activities too early with your maturing puppy. Want to read about even more creative dog exercise methods? Check out the link below for more info.